Sunny and cold today through Thursday with highs in the 30's. We warm up for Friday and Saturday with highs in the 40's on Friday, and into the 50's at lake level on Saturday. Another cold front moves through Sunday with colder air and a few snow showers. Highs dropping back into the 30's on the mountains and 40's at lake level, and then 20's on the mountains and 30's at lake level for Monday. It looks like we may stay in this pattern for a while with cold fronts every few days and temperatures fluctuating from the 20's to the 40's in between. We could see light snow showers with each cold front but not expecting any significant snowfall yet in the long-range. Snow showers continued yesterday morning. The South side of the lake picked up an inch or two from the tail end of the showers moving South early in the morning. We saw some showers fire up on the NW corner of the lake in the morning that brought a couple more inches to those ski resorts. The heaviest snow showers were on the East slope of the Sierra as expected and those areas picked up 3-4 additional inches. The forecast was for a dusting up to 2 inches with this storm. It's hard to predict where heavier snow showers could setup in these inside slider type of storms. Some ski resorts came in with only a dusting while others came in a few inches over forecast. It looks like we may be stuck in this pattern for a while. We were stuck in a warm dry pattern for a couple weeks, and now a cold dry pattern. Instead of the ridge being right over the West Coast it is sitting out in the East Pacific. 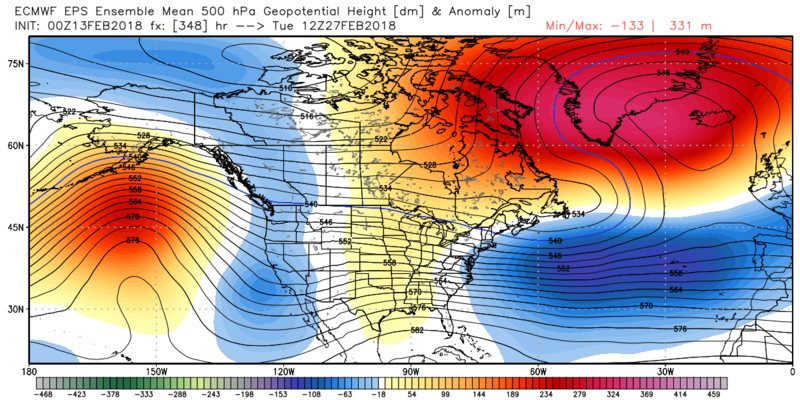 Close enough to block storms, with the storm track over the ridge and South into the Western U.S. We will get brushed on the West side of each storm every few days and get a shot of colder air. The next shot of colder air and a chance for a few light snow showers is Wednesday. Then again on Sunday. Then again next Wednesday. 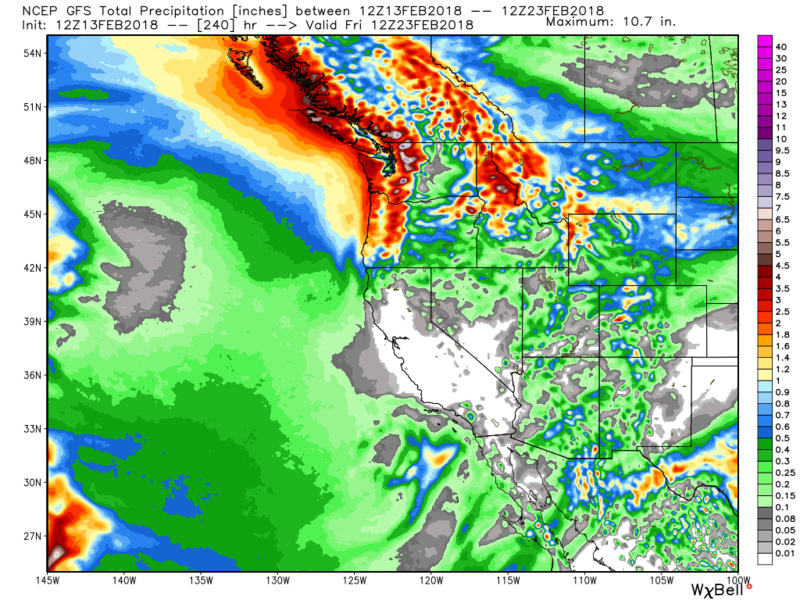 Here is a look at the GFS total precipitation forecast through next Wednesday. As we head into a big holiday weekend for skiing, the good news is that we have cold air most of this week. It was in the single digits this morning. 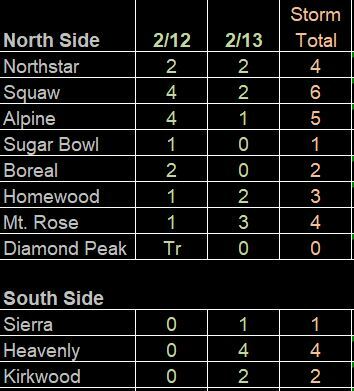 We picked up a few inches of fresh snow yesterday, and now the ski resorts are making a lot of snow heading into the weekend. The weather will be nice for Saturday, but bring warm clothes because highs drop into the 20's by Monday. The bad news is that we still don't have any significant snowfall in the forecast and will have to rely solely on the snowmaking systems for new snow. The European model has backed off on the farther West track for the Sunday-Monday system. It is more in line with the GFS now. We could se a similar storm to the one yesterday that drops an inch or two. Hopefully with a few surprise snowfall numbers again. Like I mentioned above, we may be stuck in the pattern for a while. We need the ridge in the East Pacific to back up just a bit more so these storms aren't dropping South over land and losing moisture by the time they reach us. There are still some signs in the long-range ensemble runs that could happen the last few days of the month. Just the slightest shift West in the storm track and these cold systems dropping down from the North could tap some Pacific moisture and bring us a decent snowstorm. The GFS continues to have some runs that show that the weekend of the 24th into the week of the 26th. Until then or until that happens, we are stuck in this colder dry pattern where storms drop down to our East and we just get shots of cold air and light snow showers. 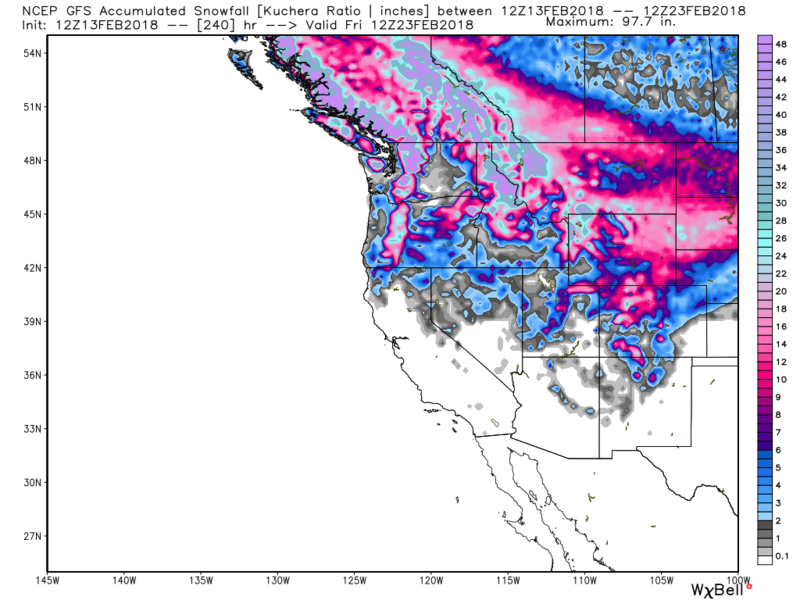 The storm track favors the PNW and Rockies. Every two weeks we seem to switch since January. Warm/wet to cold/wet to warm/dry to cold/dry. Let's hope the end of the month into March we can lock into the cold/wet pattern for a while. We have had several 200 inch March's in the past. That last one being 2011. We are on track right now with one of the lowest snowfall seasons 1975-76. That year the biggest snowfall months were March and May. Overall March is the snowiest month of the 10 lowest snowfall years. We tend to break out of the patterns that were keeping us dry all Winter in March as Spring approaches in drier years. So we will have to see if that happens again.